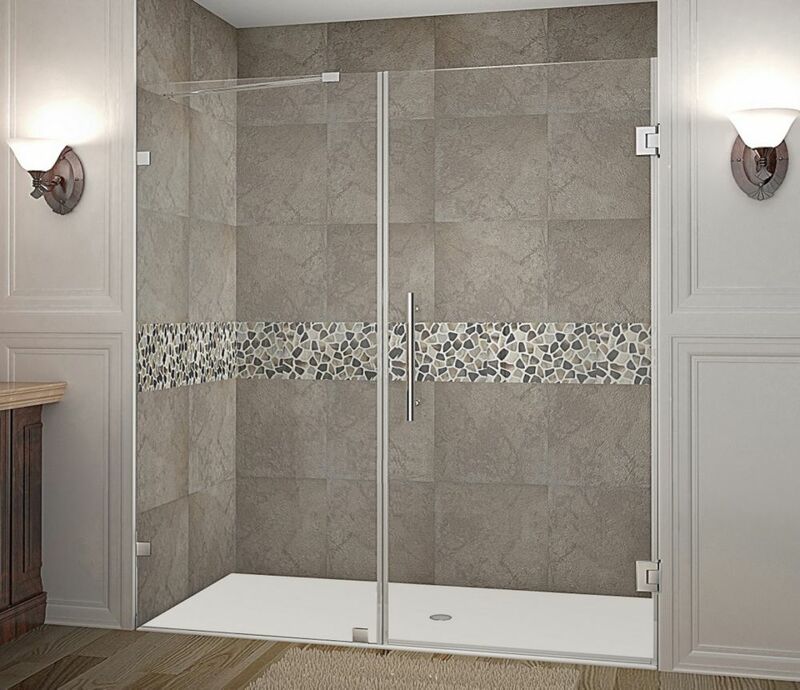 Your smaller alcove shower space can become a luxurious destination with the Aston Cascadia single panel completely frameless hinged shower door. With models ranging from 22 in. to 38 in. in width, even the smallest openings can be transformed into a modern showering experience. The Cascadia collection is constructed with 10mm ANSI-certified clear tempered glass, stainless steel or chrome finish hardware, self-centering hinges,premium leak-seal clear strips and is engineered for reversible left or right hand installation. All models include a 5 year limited warranty, standard; base not included. Your smaller alcove shower space can become a luxurious destination with the Cascadia single panel completely frameless hinged shower door. With models ranging from 22" to 38" in width, even the smallest openings can be transformed into a modern showering experience. The Cascadia collection is constructed with 10mm ANSI-certified clear tempered glass, stainless steel or chrome finish hardware, Self-Centering hinges, premium leak-seal clear strips and is engineered for reversible left or right hand installation. All models include a 5 year limited warranty, standard; base not included. Instantly upgrade your larger bathroom's alcove space with the Aston Moselle 72 in x 75 in Frameless Sliding Shower Door. This door is the perfect compliment to a larger shower alcove you may have. Accentuated with either chrome or stainless steel finished stainless steel-grade hardware, premium 3/8 in. (10mm) ANSI-certified tempered glass, reversible configuration for left or right hand opening, and deluxe full-length clear seal strips to prevent leakage, this European-inspired luxurious door instantly creates a sophisticated custom-look style for your bath at a fraction of the cost. This model does not include a shower base. Nautis 76 Inch X 72 Inch Completely Frameless Hinged Shower Door In Chrome The Nautis brings simplistic sophistication to your next bath renovation. This modern fixture consists of a fixed wall panel paired with a swinging hinged door to create a beautiful completely frameless alcove unit that instantly upgrades your bath. The Nautis is constructed with 10mm ANSI-certified clear tempered glass, stainless steel or chrome finish hardware, Self-Centering hinges, premium leak-seal clear strips and is engineered for reversible left or right hand installation. With numerous dimensions available, you are sure to find your perfect door, sizes 28" to 76" in width. All models include a 5 year limited warranty, and base is not included.